Never in the history of automotive journalism has a road loop done less justice to the launch model. For BMW’s new and outstanding M235i, the 60km test route took us south on Interstate 15 from the Las Vegas Motor Speedway to the resort city for a lap of The Strip, the crazy straight road through the heart of the vast copy-hotels, that’s dominated by neon lights, giant screens, gambling dens and overt sin that leads back to the race track. No corners, no bumps, no stretching the engine or the chassis, just an excess of cop cars controlling the speed limits. We learned only that the new 2-Series coupe – in reality a two-door version of the 1-series – copes with expansion joints, that the 240kW in-line six is flexible, the auto trany super fluent. Three laps of a 1.8km road course inside the bowl, as smooth as a drag strip, revealed only that at insane cornering speeds and without the optional limited slip differential, the inside rear wheel eventually loses traction as the M235i drifts into a benign oversteer. Lapping the 2.4km oval at 200km/h, when the lap record is 365km/h, confirms the BMW’s high speed stability and an exquisitely deep throated exhaust note, but quickly becomes almost boring in the monotony of its sweeping bends. Nothing to reveal the car’s inherent agility, a perception that though it’s grown over the previous 1-Series coupe (plus 50mm in wheelbase, plus 26mm in length and 43mm wider), the size is exactly right, the cabin small and more intimate, the windscreen closer, than the new Porsche 911. Bumps are effortlessly absorbed, the body control truly is in a different league to the old 135i. The steering, quick (2.1 turns) and consistent in its behaviour, even if genuine feel is rationed to that moment as the car slips towards the onset of oversteer. The engine is another BMW masterpiece: maximum power of 240kW arrives at 5800 and stays to 6000rpm, while peak torque of 450Nm starts at an almost silly 1300rpm and extends to 4500rpm. It revs and revs, pushing easily, effortlessly, beyond the 7000rpm to the 7250rpm limiter, and yet is marvellously tractable. And from idle to the redline makes all the right sounds. BMW Australia ignores the manual gearbox, the 8-speed automatic (responding instantly to paddle commands) delivers quicker performance – with launch control – and zero to 100km/h in a mere 4.8seconds (the manual is 5.0secs). Not quite as fast as a Mercedes-Benz A45 AMG (4.6ecs), but the M235i is a vastly more satisfying and honest drive to the one-dimensional Mercedes. 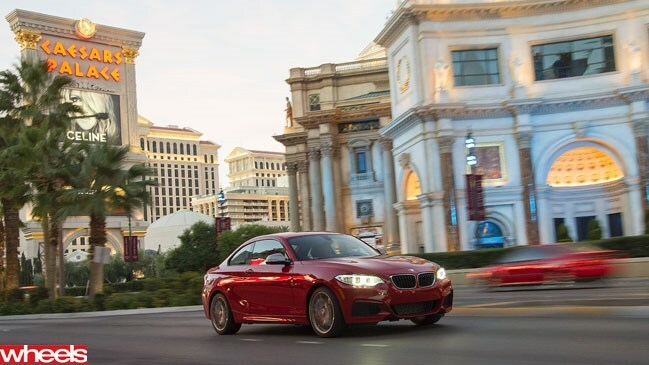 All that awareness only came the following morning when I joined a couple of friendly Pom hacks – unsurprisingly, nobody mentioned The Ashes – and we ventured our M235i into the mountains that surround Vegas. With the end of the V8 M3, I think, I know, I have a new favourite BMW. At $79,900 – up over the $71,415 of the old $135i, but way under the 435i’s $97,381 the new M235i is a performance bargain. The 2-Series also comes as a 135kW 220i ($50,500), 135kW 220d ($52,500) and will be joined a couple of months later by the 180kW 228i.